I keep banging on about how enjoyable walking is, and how much easier it is to get and stay fit if you like walking. I honestly do try to shut up sometimes, but the trouble is every time I go out for a walk, I see something interesting or thought provoking! So here’s what happened today. I started with a walk along the sea front, from the pier towards the Marine Lake. Renovations are going well, and these shots show how much has been cleared already, as well as the new concrete being laid to form the path and the new inner wall between the main lake and the small lake. 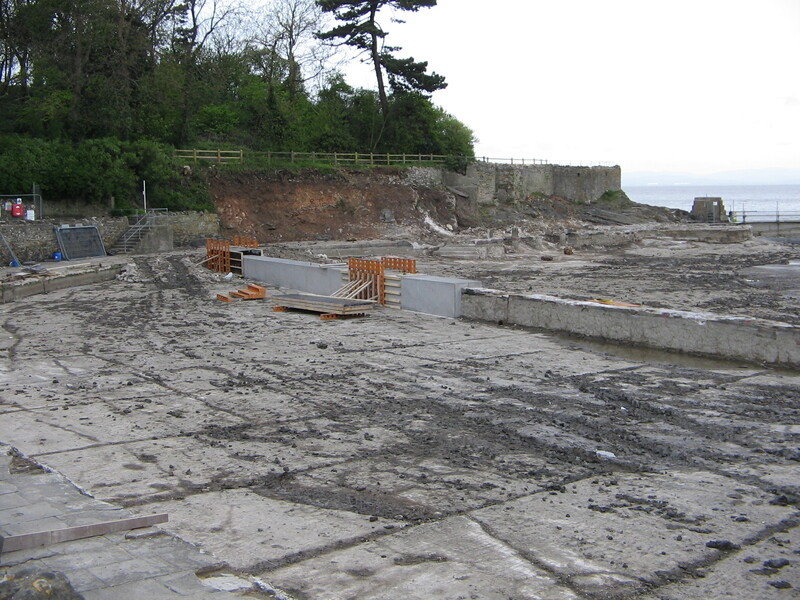 The original concrete base of the small lake is now visible, with the mud having been cleared out. They are working in sections to pour the new concrete, so it’ll be good to see how work unfolds each week. 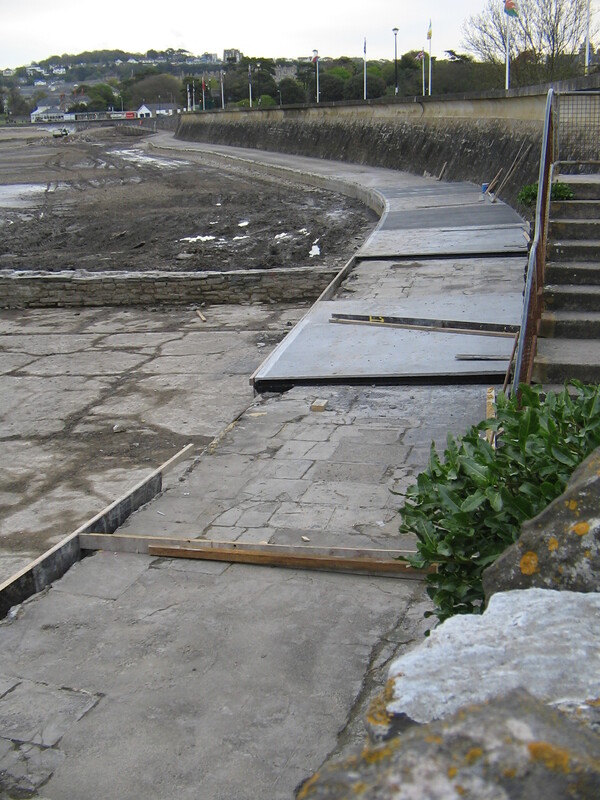 Of course, as the lake is tidal they will also need to fit in pouring fresh concrete between high tides. It’s all carefully worked out! Children (and adults) did walk along the old wall, but it was narrow and crumbly and the new version looks much more inviting and safer for crabbing. Then I walked around Poet’s walk, and onto the causeway between Clevedon Pill and Marshall’s Field (one of the key locations in the first series of Broadchurch – the field where Ellie stood while Beth was shouting at her…). It was here I saw the raven, and as wildlife is another of my interests, very glad I was to see it too! In case you don’t know, there are four black-feathered members of the crow family that you can often see in the UK, and they are generally easy to tell apart. Jackdaw’s are the smallest. They have blue eyes and a shiny grey patch across the back of their heads. They always fly in groups, and make a very distinctive chattering sound. Then you get crows (carrion crows) – very common and completely glossy black from beak to tail. They make a distinctive cawing sound. Rooks are a bit bigger and easy to identify. They have shaggy feathers round their legs, and grey skin visible round their grey beaks. They are more of a rural bird, and they move around in flocks picking up food in the fields. They nest communally in rookeries, and can be quite intimidating if you walk too close to their trees whhile they have eggs and chicks in the nest. Then there are ravens, the biggest and wildest of the crows, and glossy black from beak to tail tip. You see them if you visit the Tower of London, but otherwise they are associated with moors and mountains. Except they are also quite common around here. I saw my first raven at the Clifton suspension bridge in Bristol – sitting on one of the towers croaking (‘cronking’) away. We also saw one patrolling the roof tops near the bridge while we were eating lunch; no doubt keeping his eyes open for food he could steal. Or she, of course. But they are generally harder to make a clear identification for, as from a distance you can’t be sure how big they are and you can’t hear their vocalisations. Being glossy black, they could just be a crow. You need to get a view of their diamond shaped tail to be sure. So this morning I was pleased to see a raven and a crow flying above me, engaged in a bit of a scuffle. The crow was definitey trying to stop the raven from getting too settled, and encouraging him to move on! The bird landed down near the boats, ‘cronked’ a bit, flew around a bit more, had a run-in with a gull and then decided to move on down the coast. I saw the size difference, heard the call and saw the tail – positive ID – job done! Now I just have to spot the peregrines which nested here last year and hopefully are back now, and the avocets which were also seen.